A common question we get at National Parks at Night is, “What should I bring on one of your photo adventures?” It’s a question that applies to any trip where the purpose is night photography. Trips like this require specific gear that you might not normally take on a regular photo excursion or vacation. The ultimate goal is not to overpack and burden yourself with extraneous stuff. My goal is to pack in a way where I end up using everything I brought, and I take notes on things that could have enhanced the experience. These travel notes have turned into a Workshop Packing List that I can review each time I’m getting ready for the next adventure. This is invaluable, because it keeps me on track and not packing for hours and days sifting through all my gear! Feel free to download my list below and customize it to fit your needs. This list covers about 90 percent of what I need to bring, but I also suggest doing research on the locations and thinking of anything specific you’ll need that will help enhance or interpret that location better. Definitely check the weather predictions—for both days and nights—so you can be prepared and comfortable for what’s heading your way. I always advise bringing gear you are familiar with on workshops. When you order or rent new gear, try to have it arrive at least a few days before you leave and set aside time to get to know it. The last thing you want is to be fumbling around in the dark with unfamiliar equipment. If you’re looking to build a kit, our recommended gear page is a good starting point. But everyone sees the world differently, so gear is a very personal choice. Study the way you see, and really understand the tools that are helping create your masterpieces. I highly recommend investing in photography or travel insurance that will cover your expensive gear at home and on the road. Home owner/renter’s insurance often doesn’t cover your photo gear, especially if you are making money with it. Travel insurance isn’t that expensive, but I travel so much that photography insurance covers my gear 365 days of the year. One thing that any insurance company will ask you to do is list all your gear with serial numbers. This is a good practice anyway, and I have this document accessible to me on the road just in case. When I first started working at B&H Photo in 2001, I worked in the bag and tripod department. Obviously it was my job to find the best match for the customers’ needs, but what happened was that I became convinced that so many of their solutions could also be mine. Much to the chagrin of my wife, one of our rooms quickly filled up with 20 bags in the first three months! I didn’t know which one was best for me, so I had to try them all! I can’t recommend that strategy for others. But I can pass along the valuable lesson I learned: It is, in fact, good to have a variety of bags that can offer multiple carrying experiences. Understand what your body is capable of carrying and which styles of bag you prefer. Bringing a roller bag of gear is great on your back but not conducive to moving around on the trails at parks or on the cobblestone streets of Europe. For me, a compromise is best: I do bring a lot of photo gear on most trips, and for me a roller and a backpack is the best way to carry it all. For a roller, my hardy, well-traveled companion is The Large case by Away Travel. It’s guaranteed for life, and large enough to carry pretty much anything I need to pack, from tripods to clothing. I generally use this case for any trip of five days or more. For shorter trips, I use a smaller roller by Travelpro. 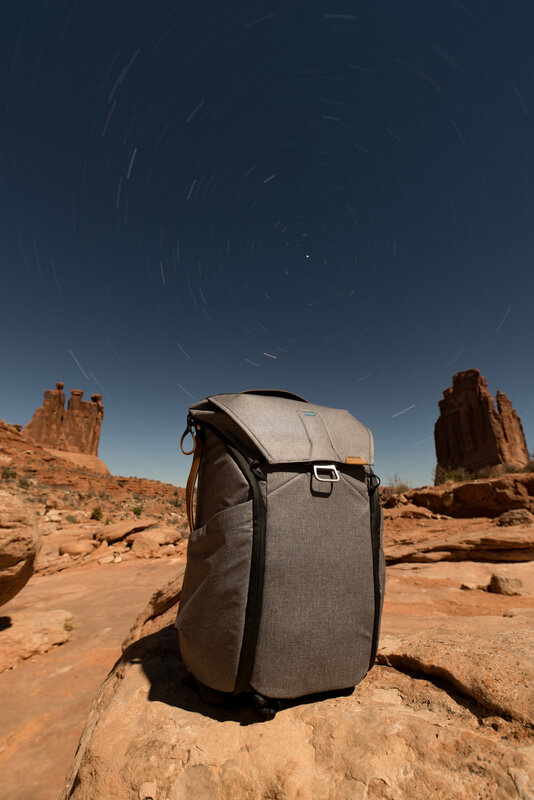 For a non-roller option, the Peak Design Everyday Backpack suits my needs perfectly. The 30L model fits up to a 15-inch laptop, plus a tablet and most of my cameras and lenses. It is super comfortable and the innovative divider system keeps me organized. However, I always like to also bring a smaller bag on my trips. When I get on-site and go out for a shoot, I don’t need or want to carry all my gear all the time. When Peak Design released their Everyday Sling bag, I found my perfect daily companion. Does it safely protect your gear? Is it comfortable to carry or wear? B&H has a 30-day return policy that really can help you take the time to figure it out which of their 500-plus bags fits you best. Just as important as bags are cable organizers and pouches. Tenba’s Cable Duo 4 helps me keep the variety of cables, cords, remotes, and other little bits and bobs organized inside my bag. Another option is the Duo 8 if you travel with lots of cables and cords! I always have two to six flashlights in the field at night. Instead of putting them all in my pockets, I use the Peak Design Field Pouch matched with their Leash Camera Strap, which gives me easy access to not only my assortment of lights, but also filters, Allen wrenches and Arca-Swiss plates. Traveling as a photographer isn’t easy. If you don’t have TSA Pre or Clear status, most U.S. airports want you to take all of your large electronics out of your bag—sometimes even all your cameras! That could mean needing to arrive to the airport even earlier. Be familiar with the restrictions, which definitely vary from country to country. Also, pay attention to what sizes and weights your airline allows. Camera gear adds significant weight to our bags, and going over the limits could incur some serious fees. Plus, smaller planes can’t fit rollers. I’ve found that my Everyday Backpack fits on even the smaller airplanes, albeit sometimes only under the seat. All I need for a night photography trip in two bags: My Peak Design backpack (top) containing my cameras and lenses comes on the plane as a carry-on, and my roller with everything else gets checked into the plane’'s belly. I try to carry on all my important and expensive gear, and I check in my cloths, tripods, liquids, cables, etc. in my roller. The main thing to remember is that we always need to carry on lithium batteries, no matter how small or big. These cannot be checked in. And they need to be either in a device, or stowed in a way so that the ends can’t come into contact with each other (wrapping them with a rubber band will suffice, though more techie options are available). Hopefully this will help you game-plan even better for your next adventure! Remember to take notes in the field and on your trip so that you can keep track of the gear that you brought and didn’t use, or that you left home and missed having. Creating your own checklist will make your gear, vision and packing experience a whole lot better!